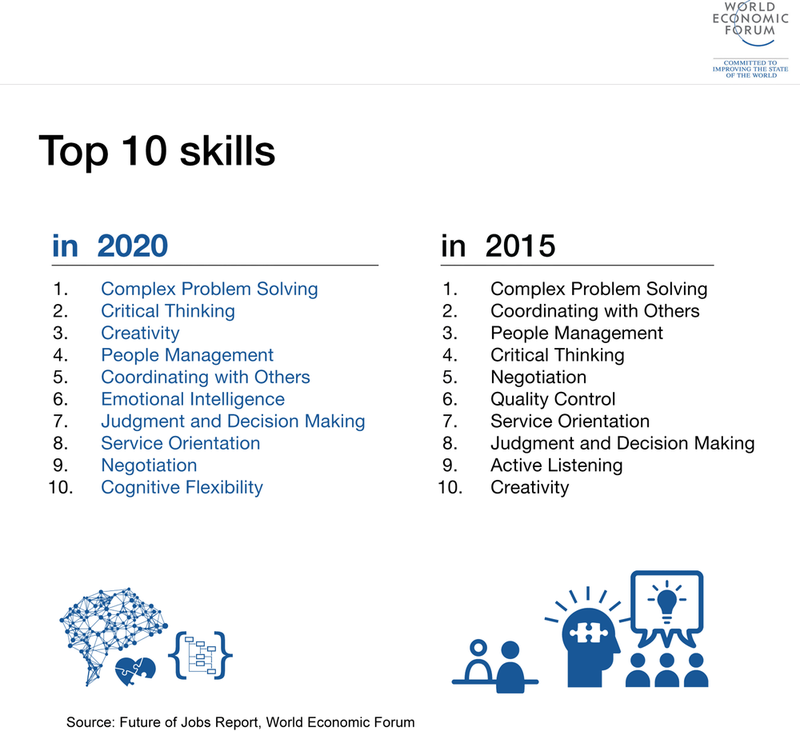 By 2020, the skill of creativity is predicted to jump from #10 to #3 in the list of “Top 10 Skills” needed in the workplace. To create the mind space you need to be more creative, what can you do, today? Wait, Wait…Please tell me! What is mind space? The opposite of mind space is when your head is full of to-dos, reminders, and negative thoughts (stress, fear, anger, judgment). When your mind is not consumed by these thoughts, you have the space to watch and attend to the positive thoughts and ideas that are problem solving or creative in nature. “Your mind is for having ideas, not for holding them.” ~David Allen. How can you create more mind space? Getting your to-do list and reminders out of your head and into a system (e.g. an inbox and calendar) that you’ve tested, and that works for you, is a step in the right direction. Cultivating a routine is also a step in the right direction. By cultivating a routine, you establish a sense of control over your day-to-day life, reducing the opportunity for stress-induced/negative reactions to what is (and always will be) a chaotic and ever-changing environment — aka life! You also remove the need for reminders as your routines become habitual. How can you establish a routine? Have you heard of the concept called Tiny Habits? I heard about it when listening to this HBR podcast interview with the CEO and creator of Wordpress. He mentions using the “tiny habits” approach to making big changes in your work and personal life. “Let me explain . . . I’ve studied human behavior for 20 years, mostly at Stanford University. Here’s what I’ve learned: Only three things will change behavior in the long term. ~William H. McRaven, retired US Navy SEAL. 1. Study the routines and habits of others. What do you think is going to work for you? What does your body positively react to, physically or emotionally? 2. Identify 1 thing that you want to start doing regularly and the powerful “Why?” that drives it. 3. Identify what you can change within your environment to support that 1 thing. Maybe it’s creating space in your home for a yoga mat to remain permanently fixed. Maybe it’s scheduling your phone to automatically switch off at 10pm. If you’re struggling to change something within your environment, ask for support and explain how this new routine will benefit you. Never assume that changing something is out of your control. 4. Take baby steps: Start trying to do that 1 thing, with x frequency. Watch how what you’re doing is making you feel, think, and do more or less of. Do you have more mind space? Are you being more creative? Are you solving problems faster? Consider using a diary to note down your observations. Try some apps for tracking your progress. I have tried HabitBull; there are countless others. Get a fitness band, especially if your daily routine goal is fitness orientated. Words of Advice: I stopped wearing my Jawbone UP band because I noticed data obsessiveness tendencies weren’t leading to more mind space for being creative. It did help me understand just how much it takes to complete 10K steps per day! If you’re trying to establish new habits and/or a new routine, and you’re not doing it 101% perfectly, then reprimanding yourself can offset any benefits. The mind, and what you tell it, is a powerful thing! Based on the results of “Watch and Track,” decide what you want to tweak. 7. Celebrate your achievement(s), then repeat steps #1 through #6. “Our brains are very bad at distinguishing between I did this huge thing and I’m feeling awesome about it and I did this tiny thing and I’m still feeling awesome about it,” Fogg says. Leverage that. And figure out a way to reward yourself — not with things that could make you feel bad afterwards, e.g. bingeing on alcohol and/or food. But things that could cultivate further mind space and being more creative, e.g. a massage and/or “time off”. This post is brought to you by Libby Swan, Chief Coach (CEO) @ PRDXN, a creatively-driven team of 75+ GTD ("get things done") technologists, servicing the digital product building & maintenance needs of various clients. This post originally appeared on their company blog. Find more about Libby and the PRDXN team @ the bi-monthly Biz & Tech of NY (BTGNY) Meetup event: next event, Thursday, June 7th. And she's "all ears" (eyes!) at libby at prdxn dot com.